Nations Press health This Bug Is Spreading A DEADLY DISEASE In Your House, Kill It Immediately Before IT KILLS YOU! This Bug Is Spreading A DEADLY DISEASE In Your House, Kill It Immediately Before IT KILLS YOU! SPONSORED LINKS There is a deadly bug reported in Southern region according to Centers for Disease Control and Prevention. Everyone Should be careful. Even though the bug looks harmless, it can carry a Trypanosoma cruzi parasite that causes Chagas disease. These bugs are typically found in the southern United States, Mexico, Central America and South America. Almost 8 million people are infected by this parasite, worldwide. According to the Centers for Disease Control and Prevention, it is not easy for this bug to give a human Chagas disease. The disease is transmitted through the bug’s feces. 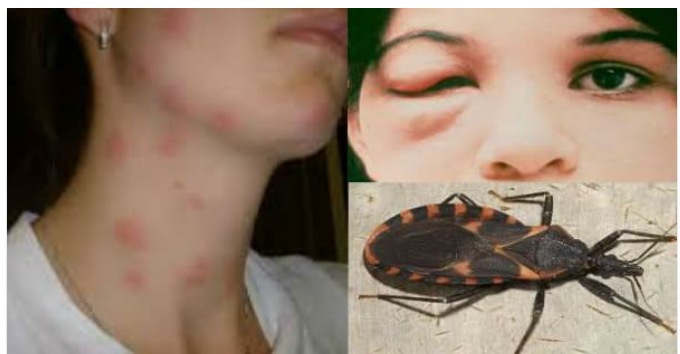 A person can only get Chagas disease from this deadly bug if the feces get rubbed into a bite wound or enter through an exposed body part such as the mouth or eyes. The species typically found in southern regions in the United States looks similar to the species that are common to Chagas disease. The tiny insect feeds on human blood much like a mosquito, but it is specific to biting the face of its victims. The bite from this deadly bug begins to itch and as the host scratches the bite introducing the pathogen. People who are bitten don’t normally feel sick, so they don’t seek medical care. But, it ends up causing heart disease in about 30% of those who are infected. Known as the triatomine bug — or less informally the “kissing bug” — according to 11-ALIVE News, the insect has been reported all across the southern regions of the United States. Below, you can see all the states that have reported the bug’s presence. All the states where the “kissing bug” has been reported. Our native species are capable of carrying the Chagas Disease pathogen, but they don’t defecate as part of their feeding behavior therefore, the pathogen is not transmitted to humans. If you think you may have found one of the bugs you can bring the sample to your closest CDC office. If you think you’ve found this dangerous bug, the CDC suggests that you should not touch or squash the bug. Place a container on top of the bug, slide the bug inside, and fill it with rubbing alcohol or, if not available, freeze the bug in the container. Then, you may take it to your local extension service, health department, or a university laboratory for species identification.